1. 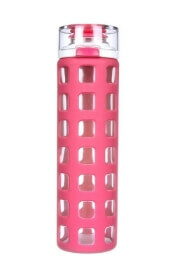 Ello Glass Water Bottle. If you’ve seen me, you probably have seen one of these with me. I think water tastes better in glass, but outside of my personal preference, using a reusable water bottle is good for the planet. Glass in particular can last for decades as it won’t degrade over time. It can break easily, however, but the colorful outer covering will protect it from damage. Trust me, I’ve dropped it many times. 2. Yoga Download Membership. I love yoga and have never found a better class than these yoga downloads. They beat every studio class, hands down, IMO. The convenience, ease and ability to take them anywhere obviously makes them a great choice…but it’s the quality that makes them unbeatable! 3. 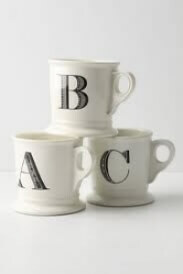 Anthropologie Monogram Mugs. Chances are good that if you receive presents from me, at one point you have gotten one of these mugs. They have all the makings of a great gift: good quality, fun and personalized. 4. Eastbay Gift Card. We go through quite a bit of athletic equipment at our house. Bball shoes, racquets, cleats, socks, balls, clothing, etc. This is our favorite website for the whole family! If you have a sport enthusiast on your list, they will love browsing this site. 5. A Blendtec Blender. Best. Investment. Ever. Have never regretted that purchase. Enough said. 6. Calphalon Cookware. THE best. Durable AND high quality. Love my Calphalon pans! 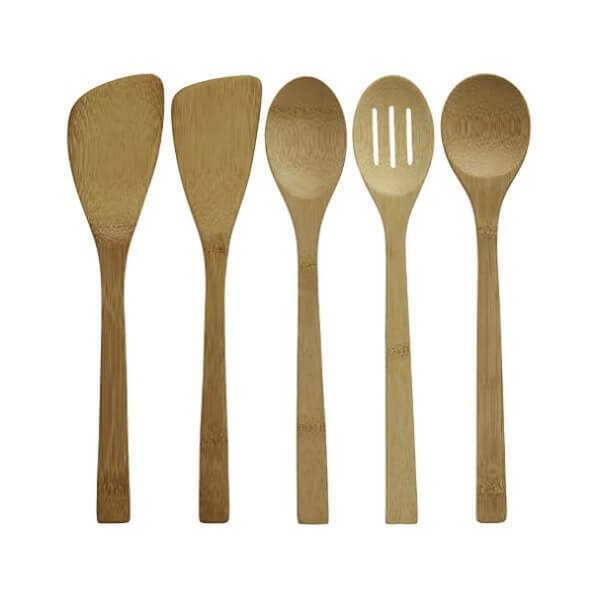 You can get non-stick or stainless steel – I’ve only tried the former. 7. Crate and Barrel Gift Card. Speaking of cookware, you can’t beat the quality and price of Crate and Barrel for kitchen gear and gadgets. I love their clean, sleek look with an emphasis on durability. I particularly like their mixing bowls, storage bowls, bamboo utensil set and their Essential Dinnerware (which you have seen many times if you follow me on Instagram). 9. Books! Like Intuitive Eating or Eat What you Love, Love What You Eat. Can you imagine a better gift than helping the loved ones in your life break free from the eat, restrict, binge, repeat cycle? These books have a non-diet approach, much like myself, and empower the reader to break free from any power food may hold over them. I’ve seen the principles outlined in these books change people’s lives and I can’t think of any better gift than that. I’m also very partial to WholeFit: Wellness For Life as I am honored to have contributed a chapter on nutrition to this book coming out on December 8th. In it I talk about Health At Every Size, self-acceptance, self-care, nutrient density and balanced meals. Along with 17 other experts, this book is a holistic approach to wellness that looks at physical, emotional, mental and spiritual health. It is well worth your time – I hope you will check it out. 10. Finally, in the name of self-care, let’s talk skin care. If you’re looking for the absolute best body lotion in the whole wide world, look no further – Raw Shea Butter Body Lotion with Frankincense and Myrrh, which couldn’t be more appropriate for a holiday gift. I put this on every morning and I can still feel it on my skin at the end of the day. I would describe it more as a creamy paste than a lotion but it rubs in nicely and lasts for hours. I find it at Target and it’s very reasonably priced! 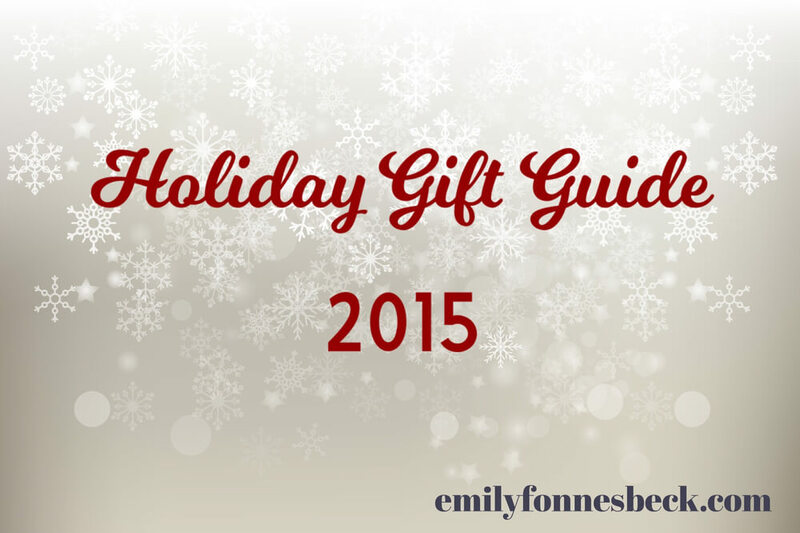 I hope I’ve helped you with gift ideas for others, or what to put on your own wish list. Happy Healthy Holidays! I love eat Healthy designs!! 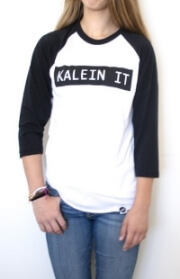 There stuff is so cute! Great gift ideas Emily!! Right!? We dietitians are suckers for food puns 🙂 Thanks for reading Heather!